yea, the ‘Element’ of surprise LOL see what I did there? 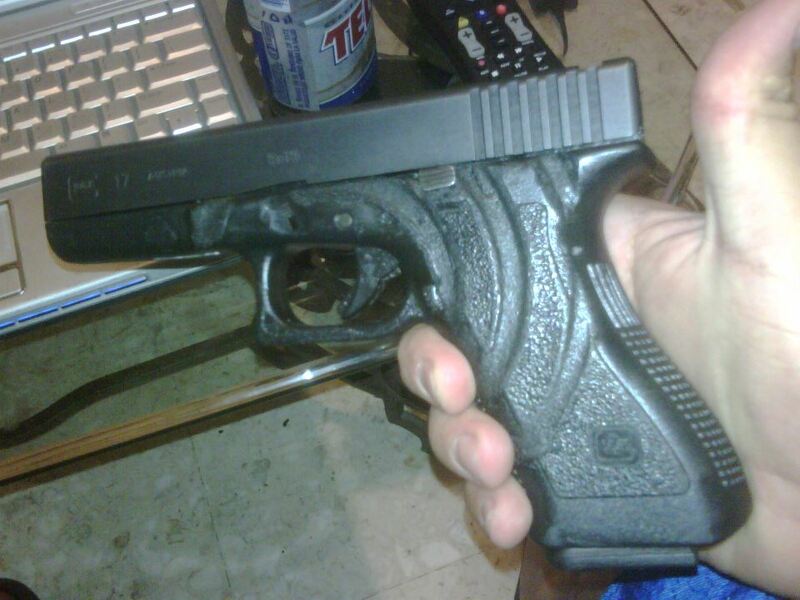 Stoves.. they have elements… that’s what burned the Glock ahhahhaa Oh man I slay me. See what happens?! This is why women make the Sandwiches. this stipling..texturing…whatever you want to call it is getting WAAAAAAAAAY outta hand. i wonder how many of these guns are gonna fail because they’ve been altered in ways that the owner can’t detect? I think someone set their gun down after making some ramen and tried to play it off like it was intentional. oh that definately was not intentional, look at the trigger. This is y i feel all polymer guns should have the internals removable like the sig 250, so that the frames can be replaced. This is why I don’t trust polymer guns. Do you set your handguns on hot stoves often, or just occasionally? Has to be intentional, no discoloring of the slide. Probably the slide was in the dishwasher…. If it was a Hi-Point, they would replace it. Whats Glock going to do? That’s because Hi-Points and Kias are cheaper to replace than repair. Oh, and yes- Glock will replace frames, what they charge for it depends on why they’re replacing it. Harsh. Hahha I love it. Still better off than this genius. Edited link, I blogged about that way before. I agree though, you can’t recover that Sig. Now the real question: Does it still work? The Glock he’s holding is worth about as much as the can of Tecate on the desk. Looks like he screwed up the magazine release and the disassembly levers on the side. I can’t Imagine this was intended. That’s a Dell XPS M1210 laptop in the background there. One of my favorites – I had it for years before I upgraded. haha first the Tecate and now the laptop. You guys are hilarious. I’m now waiting for someone to chime in saying how much they love that universal remote. I wonder who does his nails……. I’ve the slight feeling (but I’m not an expert, you guys correct me if I’m wrong) that the dude put it WITH the magazine engaged. Because of the way it sticks out of the handgrip like it’s twisted (or maybe it’s just the picture). Plus the lower part of the grip seems deteriorated in a way the magazine would be tough to get in or out. Did this moron also put the ammo in the oven? Tecate is mexican piss in a can… just sayin.